But what is Chávez’s plan? What exactly is “the cause and the mission” he shares with the Jackal? To truly understand Chávez’s grand designs one has to return to the Venezuela of the 1960s, to “the resistance,” and to the guerrillas who nurtured and mentored both Chávez and Carlos the Jackal. This story begins with a prison break. In the San Carlos military stockade in Caracas, three men sit in their cells: Guillermo García Ponce, Teodoro Petkoff, and Luis Miquilena. Unbeknownst to them, all will play crucial roles in the life of a nine-year-old boy they have never heard of: Hugo Chávez. Their crime? Being communists and aiding the Armed Forces of National Liberation (FALN)—the militant wing of the Venezuelan Communist Party’s (PCV) that is waging a guerrilla war against the government. But that all changes when the FALN step up their assaults in an effort to sabotage the December 1963 elections. It is a crucial vote—the first time in Venezuelan history that a democratically elected leader will pass the reins of power to another democratically elected leader. After two failed coup attempts orchestrated by Castro and the FALN, President Betancourt decides he has had enough; he suspends the amnesty and initiates a massive crackdown. Soon Petkoff, Miquilena, and García Ponce are the star guests in the San Carlos military stockade. Realizing that their rebellion may soon collapse, the FALN leaders decide they must break out of jail. Using an ingenious system of clandestine communication—everything from notes written on the skin of an onion to a compass stuffed in a rotisserie chicken—they begin working with their comrades on the outside to build a tunnel into the prison. A young Syrian Marxist named Nehemet Simón spearheads the effort: he buys a coffee shop across the street from the prison and while he serves espresso and pastelitos to the off-duty prison guards, his workers begin digging a 60-meter tunnel toward the prison. But the work is slow going: the air in the tunnel makes the workers sick and twice they discover they have lost their bearings underground. In the end, a tunnel they hoped would take a few months to dig takes three and a half years to complete. On February 7, 1967 they finally attempt their escape. It is Fat Tuesday, the end of Carnaval. Luis Miquilena has since been released so Pompeyo Márquez, another FALN leader, joins Petkoff and García Ponce. All day they wait anxiously for the signal, a taping from underneath the floor. At precisely 7 p.m. it finally comes. They lift a floor panel to find the smiling face of Nelson López, one of Simón’s workers. First into the tunnel is Márquez, then García Ponce, and finally Petkoff. (12) They emerge a few minutes later in the coffee shop across the street, and Simón quietly drives them away in the back of his station wagon. They are free. The newspapers declare it the most amazing prison break in history and the tunnel becomes a tourist attraction. Simón immediately flees the country, but the other men stay, living in safe houses and working clandestinely for the resistance. Tragically, Nelson López, who helped dig the tunnel, is killed just a few days later by the Venezuelan Political Police (Digipol). Yet, even though Petkoff and García Ponce are free, the resistance is still collapsing, principally because the FALN will never gain the support of the people they need the most—the poor. 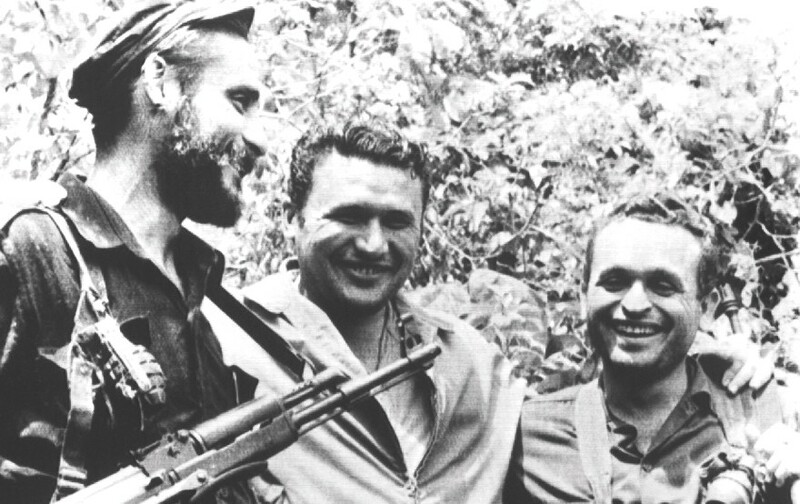 In this snapshot taken on December 10, 1962, Mexican magazine editor Mario Menendez (Center) poses with guerrilla leader Douglas Bravo (Right) and Luben Petkoff (Left)--the brother of Teodoro Petkoff. Teodoro Petkoff said that his brother was an excellent fighter and that Venezuela's security forces tried over and over to get him, but always failed. But the woes of the communists were not quite over. In 1971 the PCV split into pro- and anti-Soviet camps, in part over the role of violence in “the revolution” and in part because of the Soviet invasion of Czechoslovakia. Petkoff also felt that the communists had made an enormous error by aligning with Castro. In response, he founded an anti-Soviet group which was christened the Movement Toward Socialism (MAS). (16) García Ponce remained with the official communist party, the PCV, and Miquilena worked with the center-left party URD. MAS became the largest of the three parties and the most mainstream. It was a dying movement and most of the communists soon melted back into everyday life—working in schools, the courts, and the military. They were in remission. But they would eventually have their day. It was into this political climate that a 17-year-old Hugo Chávez entered the Venezuelan Military Academy in 1971…but not to fight the remaining guerrilla. “I dreamed of being a professional baseball player,” he said. “I didn’t enter the military academy because I wanted to be a soldier, but because that was the only way to get to Caracas.” (18) Chávez, one of six boys, had been born in a rancho, a cheap brick hut, in the small country town of Sabaneta. The military was his ticket out of the plains and into the big baseball stadiums of Caracas. But despite his initial intentions, Chávez was soon thrown into the political struggle. As a Lieutenant, his first assignments were in counter-insurgency: it was his job to hunt down and eradicate the remaining guerrillas. But Chávez quickly found that he empathized with the insurgents. Two events helped galvanize his views. It is important to note that Bravo’s insistence that the revolution had to use violence was not necessarily born of a vicious militancy; but rather by logic. He and the radical left were a minority; they knew that, their failure to win elections proved it. For a minority to gain power, you needed guns. The trick was to gain power by force, then take on a populist disguise to present your uprising as the will of the masses. The opportunity to take power finally came on February 4, 1992. Just before dawn, the 38-year-old Chávez, now a Lt. Colonel, led one of five army units in an attempt to overthrow Venezuela’s very unpopular president, Carlos Andrés Pérez. Chávez, however, failed to accomplish his key part of the mission—capturing President Pérez—and soon found himself and his men surrounded in the Military Museum. While some of the other commanders had captured their objectives in other cities, a partial coup was no coup at all and Chávez—unbeknownst to his friends—quickly brokered a deal with the government. To get the other conspirators to give up, Chávez was permitted to make a nationally televised plea. It was the beginning of his life as a politician. The paratrooper told his comrades to put down their weapons because it was futile to keep fighting, then he graciously took full responsibility for the botched coup. (26) Then a curious thing happened. Chávez, instead of being despised and loathed for breaking the law, suddenly became a hero. In fact, by the time of the annual Mardi gras festival, the masquerade costume of choice for little boys was the green fatigues and red beret of Hugo Chávez. Why? While the two major political parties (Acción Democrática and Copei) had reigned over an impressive period of modernity during the oil-boom years of the 1970s, by the early ‘90s they were viewed as out of touch with the masses. Corrupted by oil wealth, they had created a pseudo-democracy that catered only to the middle and upper-classes through a system of clientelism that neglected the poor. In Hugo Chávez people saw someone taking a stand against the corrupt system; someone brave enough to risk his life to change Venezuela. Viewed as an outsider, Chávez, with his coffee-and-cream skin and humble background, seemed more in tune with the needs of the poor and disenfranchised than the light-skinned leaders who dominated politics. Unwittingly, Chávez had gained the perfect populist disguise. Bowing to Chávez’s growing popularity, President Rafael Caldera ordered his release from prison in March 1994. He was free. However, he was also broke and homeless. Luckily, someone was waiting for him when he stepped out of prison and into the sunlight, a man who had decided that Hugo Chávez was his best chance for reviving the revolution of the 1960s—Luis Miquilena. Miquilena took Chávez into his home and soon launched him as a political candidate with their eyes on the presidency. At first, Chávez was reluctant. He still believed that armed force was the only way to achieve true revolution. But Miquilena was able to convince him that it could be done through the ballot box. In 1999 Hugo Chávez became the president of Venezuela, and Miquilena finally realized his dream—he was the president of the Assembly that created a new constitution (Carlos the Jackal, by the way, was almost made an honorary member of the assembly). It was a major shift in power for Venezuela. 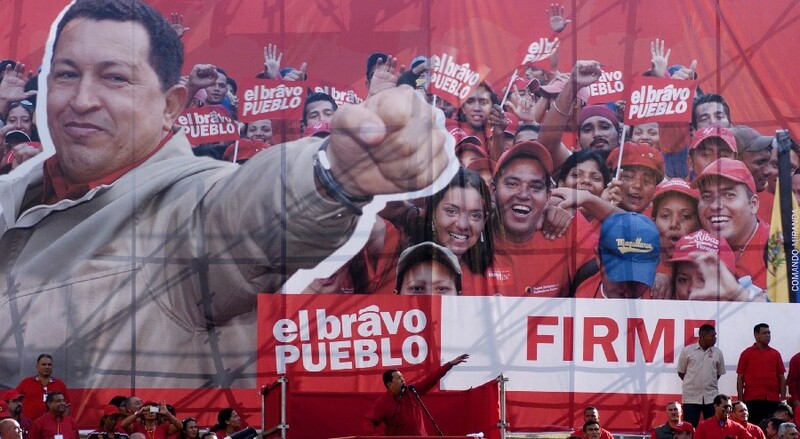 Chávez’s alliance cleverly gained control of 122 of the assembly’s 131 seats. The Assembly, in turn, made sure that Chávez’s coalition gained unprecedented control over the legislature and the Supreme Court. Venezuelan President Hugo Chávez with Luis Miquilena. Accordingly, many former guerrillas were given important posts in the new government. Luis Miqilena became the Minister of the Interior. 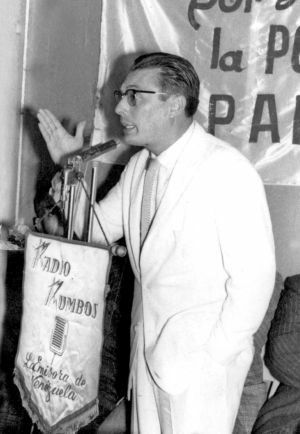 Guillermo García Ponce became one of the president’s closest advisors: a leader of the Tactical Command for the Revolution and, later, the editor of Vea—the daily mouthpiece of the revolution. By now Chávez’s Bolivarian Revolutionary had matured significantly. Borrowing heavily from Cuban and Soviet doctrine, Chávez’s economic policy rejected what the president called “the demons sown by capitalism,” namely, globalization, the Washington Consensus, and neoliberalism—the combination of privatization, free trade, and austerity policies that many blamed for the country’s economic collapse. Chávez’s foreign policy was also heavily influenced by anti-Americanism, most clearly embodied in his desire to create a regional power bloc—the Bolivarian Alliance for the Peoples of Our America, ALBA—powerful enough to compete with the U.S. and the European Union. It currently has nine members including Cuba, Nicaragua, Ecuador, and Bolivia. For Chávez the idea holds a special romanticism as it neatly links him to his political muse, Simón Bolivar—one of the principal leaders of South America’s wars of independence from Spain. Bolívar in his day had also been distrustful of the US and wanted to create a “United States of South America.” In 1819 Bolívar was able to make a start with Gran Colómbia—the short-lived union of Colombia, Ecuador, Panama and Venezuela. Chávez hopes to reunite those countries and perhaps many more…. 2. Romero, Simon, “Chávez Offers Public Defense Of 'the Jackal'” The New York Times. November 22, 2009. 4. U.S. Department of Energy, International Energy Annual 2003, (Washington, DC: DOE, 2004) <http://www.eia.doe.gov/iea/pet.html> (4 March 2006). I have removed Canada from the list of producers (sometimes listed second) because most of its proven reserves are made up of oil sands. 5. “While China and the Italian communists…” Specific amounts of aid to the FALN are fragmentary. In 1965 three Italians were caught sending $330,000 to the FALN; China sent $300,000. Wickham-Crowley, Timothy. Guerrillas and Revolution in Latin America: A Comparative Study of Insurgents and Regimes Since 1956. Princeton University Press, 1993. P. 88. 6. Haggerty, Richard, Venezuela: A Country Study, Library of Congress, Washington, DC, 1990. P. 26. 7. On June 27th, 2006, the Venezuelan government erected a memorial in honor of Montoto, now considered a fallen comrade not a foreign invader, and held a reenactment of the failed invasion. See Verlezza, Ricardo. “Homenaje a cubano caido en la invasion cubana comunista en 1967 a Venezuela.” Aporrea y Diario La Voz. 20 July 2006. 9. “The Triumph of Democracy.” The Library of Congress Country Studies: Venezuela. 1990. Garrido, Alberto. “El eje revolucionario Chávez-Castro.” El Universal. 27 June 2004. 10. “…getting help from the Americans…” “Return of the F.A.L.N.” Time Magazine. 24 July 1964. <<http://www.time.com/time/magazine/article/0,9171,939029,00.html?promoid=googlep>> 20 September 2008. 11. Garcia Ponce, La Fuga, op. cit. P. 175. 12. All day they wait anxiously for the signal, a taping from underneath the floor. At precisely 7 pm, it finally comes. They lift a floor panel to find the smiling face of Nelson López, one of Simón’s workers. First into the tunnel is Márquez, then García Ponce, and finally Petkoff: Author’s Email Interview, Teodoro Petkoff, Caracas, Venezuela. December 22, 2009. 13. Haggerty, Richard, Venezuela: A Country Study, Library of Congress, Washington, DC, 1990. P. 26. 14. García Ponce makes an indirect reference to the Breshnev/Castro dispute and the pulling of funds for the FALN in his book La fuga del Cuartel San Carlos. “Various factors contributed to this [deteriorating] political picture, but the principal cause was grave sectarian errors that caused the distancing of important allies...” Translation is my own. P. 103. 15. Bravo was ejected by the communists: Jones, Bart, !Hugo! The Hugo Chávez Story from Mud Hut to Perpetual Revolution (2007, Steerforth Press). P. 70-71. 16. “Rival Communist Conferences in Venezuela” Associated Press, Munich, 15 March 1971. 17. Haggerty, Richard, Venezuela: A Country Study, Library of Congress, Washington, DC, 1990. P. 31. 18. Chávez, Hugo, Chávez, Venezuela and the New Latin America, (New York: Ocean Press, 2005), 14. 20. Marquez, op cit. P. 20. 21. “Chávez felt that the real enemy was the rich, the oligarchs…”: Marcano, Cristina and Barrera Tyszka, Alberto. Hugo Chávez: The Definitive Biography of Venezuela’s Controversial President. Random House. New York. 2006. P. 53. 22. Chávez, Hugo, Chávez, Venezuela and the New Latin America, op. cit. 69. 23. Wilson, Scott. “Clash of Visions Pushed Venezuela Toward Coup.” The Washington Post. 21 April 2002; Page A01. 24. Chávez’s goals were best presented by Kleber Ramírez, who drafted a framework for Chávez post-1992 coup. See Marcano, Cristina and Barrera Tyszka, Alberto. op cit. P. 81-83. 25. “…all the while trying to maneuver himself into a position to get more power—more troops and more hardware.” Jones, Bart op cit. P. 74. 26. Gott, Richard, In The Shadow..., 66-72. 27. “begun a mass movement”: Gott, Richard, In The Shadow..., 84. 28. “He filled the vacuum….to resolve our social problems.” Author’s interview, Luis Miquilena, 26 January 2004. Caracas.